R.L. 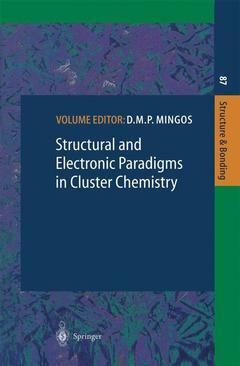 Johnston, Mathematical Cluster Chemistry.- Z. Lin and M.-F. Fan, Metal-Metal Interactions in Transition Metal Clusters with -Donor Ligands.- J.-F. Halet and J.-Y. Saillard, Electron Count Versus Structural Arrangement in Clusters Based on a Cubic Transition Metal Core with Bridging Main Group Elements.- T.P. Fehlner, Metallaboranes.- C.E. Housecroft, Clusters with Interstitial Atoms from the p-Block: How Do Wade's Rules Handle Them?.- J.D. Corbett, Diverse Naked Clusters of the Heavy Main-Group Elements. Electronic Regularities and Analogies. Mathematical cluster chemistry.- Metal-metal interactions in transition metal clusters with ?-donor ligands.- Electron count versus structural arrangement in clusters based on a cubic transition metal core with bridging main group elements.- Metallaboranes.- Clusters with interstitial atoms from the p-block: How do Wade's rules handle them?.- Diverse naked clusters of the heavy main-group elements. Electronic regularities and analogies.